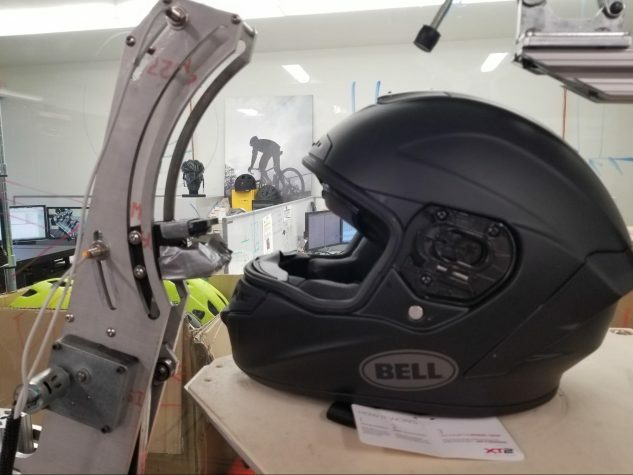 Bell Powersports invited us to tour its American R&D and design facility this week so we could see with our own eyes the care and dedication that goes into the creation and testing of its head-protection efforts. It was enlightening to learn all that goes on behind the scenes at its Scotts Valley, California, location. Bell was originally founded in 1923 as Bell Auto Parts, as it was based in Bell, California. It became one of the leading helmet manufacturers in the 1950s, and in 1963 F1 driver Jim Clark became Bell’s first world driving champion. As of 2016, Bell is under the Vista Outdoor umbrella and operates its Bell Powersports division to produce motorcycle helmets, along with its Giro and Blackburn bicycle helmet brands. The manufacturing of Bell’s helmets takes place in China. 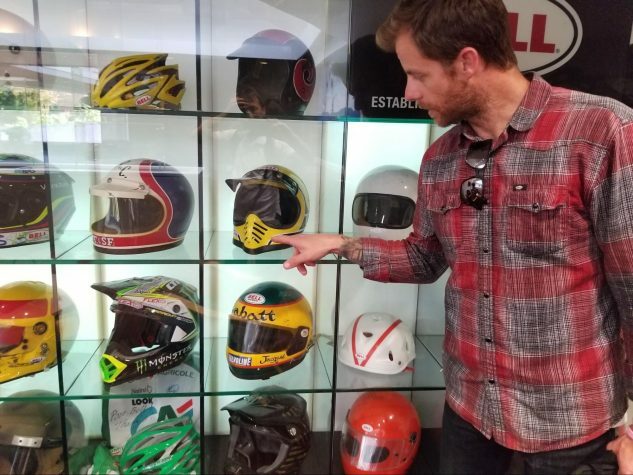 Bell’s marketing manager Chris Killen points at an original Bob “Hurricane” Hannah helmet from the mid-1970s. Helmet engineering was at a fairly primitive stage back then, as evident from the hand-milled air vents in the chinbar. 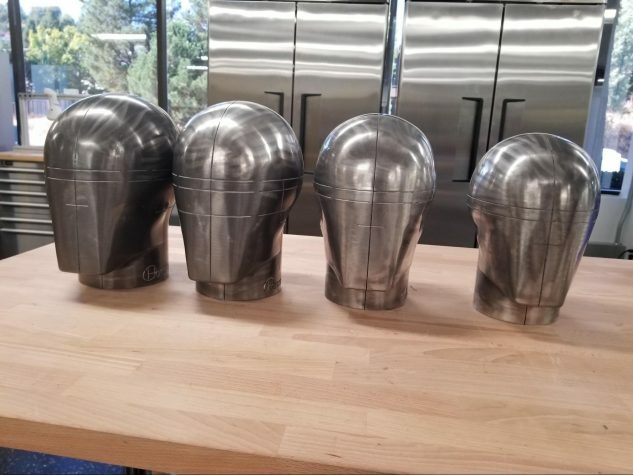 Inside its Scotts Valley location are 140 employees using an office area for administrative and design activities, as well as a fabrication shop with three CNC mills, a 3-D printing room and, most interestingly, its testing facility where helmets undergo brutal impact testing. Dubbed as DOME (Design, Observation, Materials and Engineering), the lab includes drop testing and angled-impact testing that proves the worth of reducing rotational impacts via Bell’s MIPS (Multi-Directional Impact Protection System) and Flex movable helmet liners. 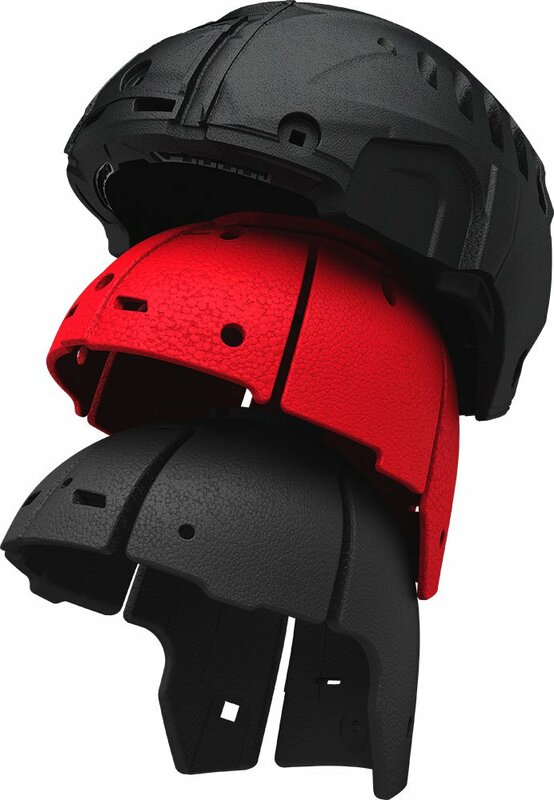 MIPS is one of the latest advances in head protection, as the shock-absorbing inner structure is designed to slightly rotate on impact – slip-plane-technology – to reduce rotational forces caused by angled impacts that can damage a brain. 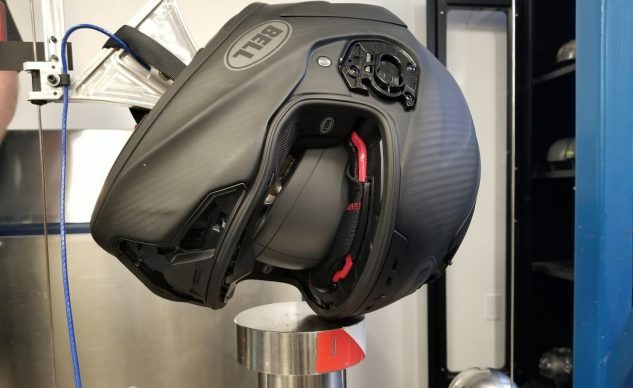 MIPS liners are said to achieve a 30% reduction in rotational forces, so you’ll be hearing a lot more about them being incorporated into new helmets in the near future. 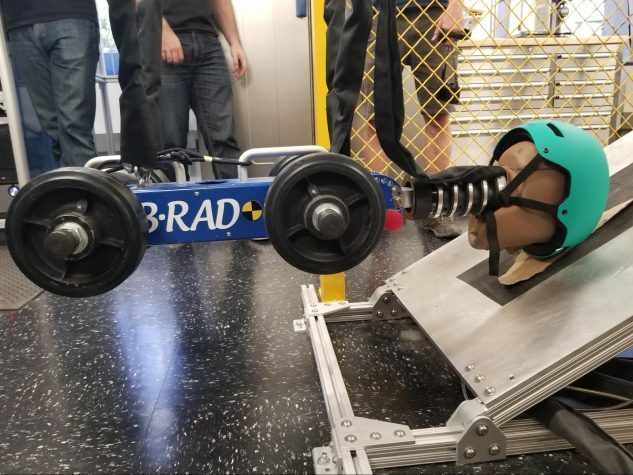 The B-RAD device was designed in-house to test rotational impacts, using a headform and neck from a crash test dummy. The material used on anvils at the point of impact is essentially 40-grit sandpaper, which mimics the traction of asphalt. MIPS is currently found in Bell’s Moto-9 motocross lid and its new Star MIPS and RS-2 helmets. Additionally, the high-end Race Star and Pro Star are equipped with Bell’s proprietary three-layer Flex liner that also damps rotational forces. Development time for new helmet ranges from just 12 months for simpler designs, but the Flex system required five years of evolution before it hit the market. Instead of a single layer of EPS (expanded polystyrene) as typically used in helmets, the Flex liner in the Pro Star and Race Star uses three types of foam. The layer next to the shell is traditional EPS, while the middle one is a softer material called EPP (expanded polypropylene). The layer closest to the skull is EPO (expanded polyolefin). They combine to contribute to a measure of movement that reduce rotational forces on the brain, similar but different than offered from the patented MIPS technology invented in Sweden. Scroll down to see pictures from inside DOME and watch a couple of videos of impact testing. 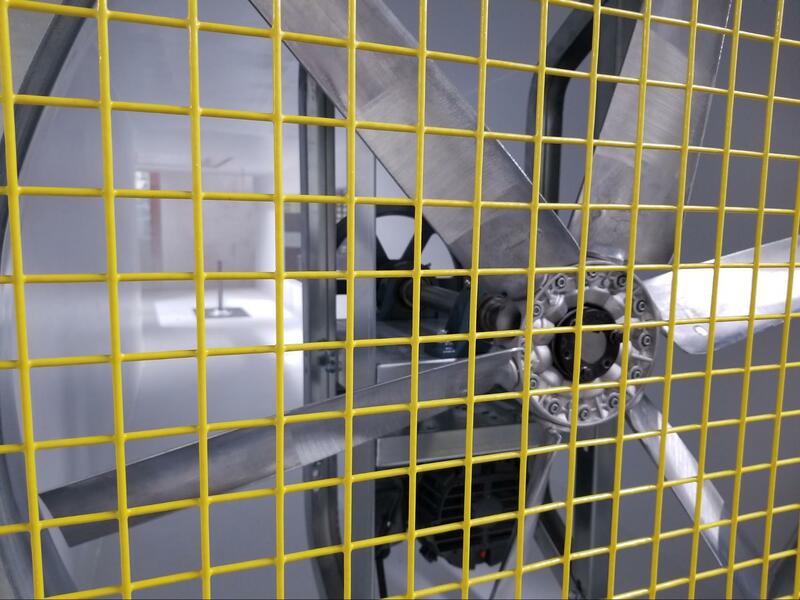 A small wind tunnel in the lab is used for aerodynamic testing up to 30 mph. Labs in Washington and Arizona are employed to test higher-speed aerodynamics and sound levels. Magnesium is used for headforms of different sizes to be placed inside helmets for impact testing because the metal has a similar density to a human head and produces negligible sound resonance that can muddle test results. The video above shows a rig designed in-house by test lab engineer Patrick Burke at Bell. 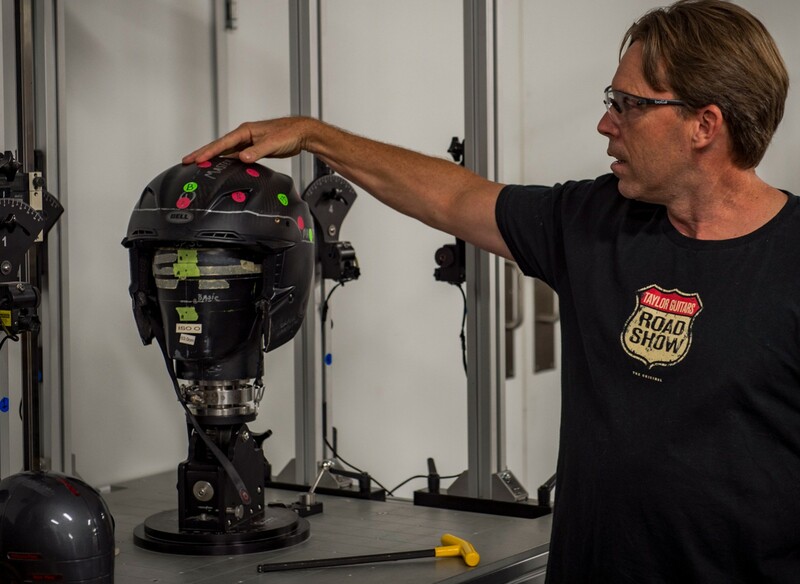 Here’s a traditional drop test at the Snell Foundation’s 7.75 meters/second velocity, the highest speed among motorcycle helmet impact tests. This particular test registered 192 g, well below the Snell limit of 275 g (in a size medium headform). Bell’s engineers say a 2-inch drop of a bare head would yield about same g force on a human skull! This rig is to test the durability of faceshield mechanisms, opening and closing a visor some 50,000 times. Helmets are also tested in ovens and freezers from temperatures ranging from 122F deg to -4, as well as in water tanks. This video shows Bell’s MIPS sled, one of just two in the world (the other is at the MIPS facility in Sweden), built at a purported cost of around $200,000. This test, operated by engineer Clint Hostetler, is what is called a “backwards” drop. Ouch! We were fascinated by this tour with Bell and trust it was enlightening for you, too. For more on Bell, we invite you to check out its Powersports website.